An attendee of the USA Science and Engineering Festival (2014) observes NASA's first dexterous humanoid robot Robonaut 2, at the NASA Stage. At the time R2 had recently received 1.2 meter long legs to allow mobility. 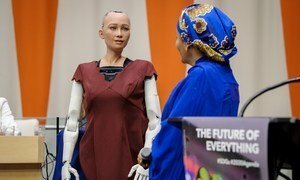 The “upsurge” in patent applications for devices and machines powered by Artificial Intelligence (AI) in the last five years, suggests that it could soon revolutionize all areas of daily life far beyond the tech world, a UN report suggested on Thursday. According to the World Intellectual Property Organization (WIPO) Technology Trends report, 50 per cent of all patents for AI – the replication of human intelligence by machines for use in industries such as transport and healthcare, for instance – have been published since 2013, adding up to more than 170,000 different patented ideas. This followed on from an initial boom in AI scientific publications, which began in 2001. WIPO Director General Francis Gurry told journalists in Geneva the surge in patenting was “striking”, noting that AI research began in the 1950s. “But there has been a quantum leap since about 2013, so we’re dealing with what is happening right now in a very fast-moving field,” he insisted. By number, patent applications for machine learning, indicate that this is currently the dominant application of AI; think of apps that include ride-sharing services to minimize detours. The fastest-growing AI area is “deep learning”, however, which is used in speech recognition. This saw a 175-per cent annual increase in patent applications from 2013 to 2016, far in excess of the 33 per cent average for all patents in the same period. The United States and China dominate the field of patent application, although only a fraction of China’s patents is filed abroad. US-based tech giant IBM leads by number of patent applications (8,290), followed by Microsoft (5,930). Japan’s Toshiba has the next highest patent tally (5,223), ahead of South Korea’s Samsung (5,102) and Japan’s NEC Group (4,406). China’s increasingly important role in the sector is also illustrated by the fact that Chinese organizations make up 17 of the top 20 academic players in AI patenting, as well as 10 of the top 20 in AI-related scientific publications. In coming years, AI is set to grow with “major military and economic” uses, Mr Gurry suggested, before highlighting the importance of proposed WIPO-led discussions between Member States, on legal and ethical issues relating to intellectual property rights that have been raised by the technology. “One would expect that the strategic focus of major geopolitical players will turn to their positioning in relation to AI,” he said. Internet search giants have also been key to the AI revolution, the WIPO report shows, with Google (US) and Baidu (China) embracing the potential of the technology early on, just as Microsoft and Apple did before them. In addition to the US and China’s large populations, the WIPO head noted the importance of State-led support for innovation in both places, which included investing in technology hubs and even training specialized patent officers. Faced with this backing, “it’s very difficult for other countries, even those with great education, to compete with the business, engineering and investing talent” of China and the US, AI expert and CEO of Landing AI and deeplearning.ai, Andrew Ng, notes in the WIPO publication, adding that the “biggest untapped opportunities” lie outside the software industry, in areas including agriculture, healthcare and manufacturing. Echoing those comments, the WIPO Director General noted that the cultural and linguistic diversity of Europe “is not necessarily favouring the formation of major data pools. And we all know the more data, the better for machine learning for example, the results, you are going to get”. Asked whether the world was better off because of the technology, which industry experts credit with the potential to create massive economic value, the WIPO Director General underlined the fact that the science behind it is “neutral”. 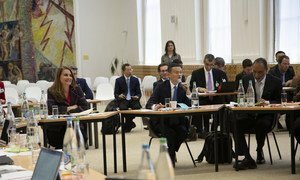 Key discussions among global decision-makers and influencers have taken place at the UN in Geneva this week, aiming to limit the growing risk of international cyber-attacks while promoting the advantages of digital technology, amid a call by the UN chief for “bold, innovative ideas”. Digital solutions are transforming lives: Think of robots that help the elderly, a mobile phone app that identifies crop pests, or surgical robots in hospitals. These advances are all due to Artificial Intelligence and an extraordinary new era of machine learning.